Bill graduated from the American Academy of Art in Chicago. Exposure to the great Impressionist Collection at Chicago’s Art Institute while at school was instrumental. He also credits study with Wolf Kahn, Irwin Greenberg, and Coralie Tweed. An artist for over 50 years, his painterly landscapes and figurative works in oil and pastel have been appearing in galleries around the Southeast for five decades. What began as a career in illustration, with commissions from publishers and national corporations such as Coca-Cola, Delta Air Lines and Lockheed has evolved into a full time, happy commitment to doing his own work, for his own reasons, in his own way. His training at the American Academy of Art, Chicago, Illinois, provided a traditional academic education which he always appreciated as a foundation and sought to move beyond, as all artists must, who hope to find a way to say something unique, important to them and possibly to others. Bill is represented in galleries in Georgia (Atlanta, Lake Buirton and Blue Ridge) as well as South Carolina, North Carolina, Tennessee. In 2001 he and his wife Pat retired to the Appalachian foothills of North Georgia – where he finds a visual feast available to him just outside his door. He uses oils, pastel, and acrylics in creating landscapes and figurative work, and while painting plein air. 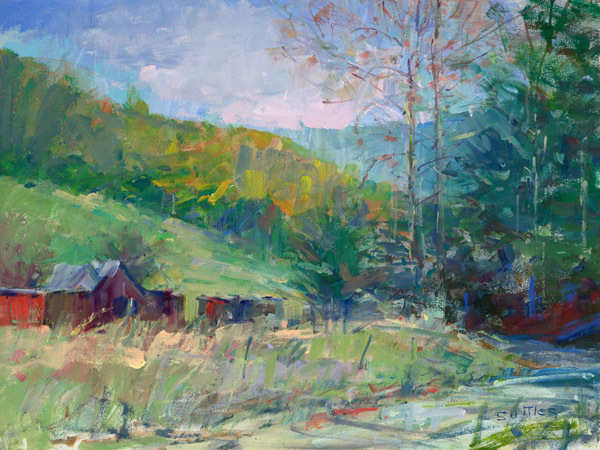 Bill is a member of the Blue Ridge Mountains Arts Association, The Southern Appalachian Artist Guild, and The Southeastern Pastel Society.